Using a big pot (a pasta drainer pot with holes in the lid works great! 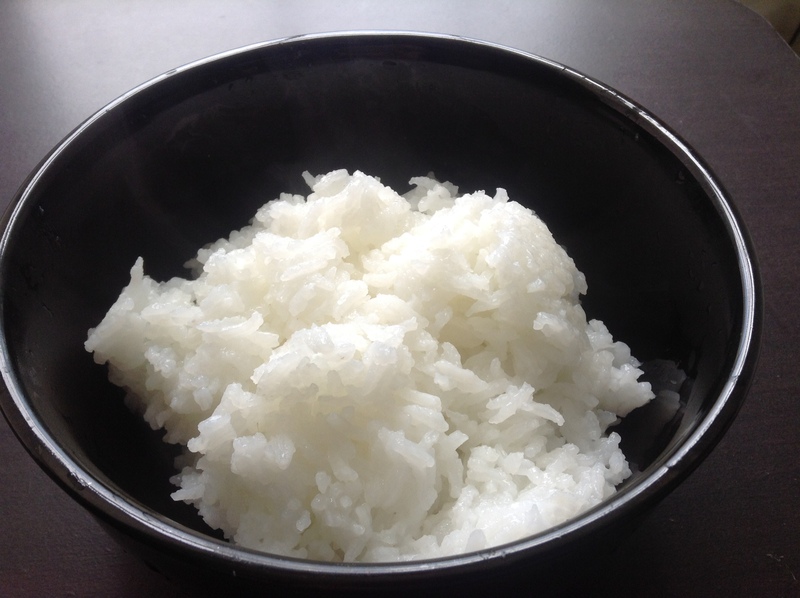 ), rinse and wash 1 cup of rice. Then add 5-6 cups of water. Bring water in the pot to a boil on medium heat with the cover on. Once the water starts to boil, turn down the fire so that the pot is just simmering and cover the pot again. Set the timer for 15-20 minutes. Once the timer is up, take a spoon to check and taste to see whether the rice is done. If it is, immediately turn off the fire, and drain as much of the excess liquid from the pot as you can. Then let the pot sit uncovered for at least 5-10 minutes to allow further excess moisture to evaporate. Optimal cooking times can vary depending on the type of rice you use (e.g., brown rice versus white rice, short grain versus long grain). In general, brown rice will take a bit longer than white rice to cook through. To help reduce cooking time for brown rice, soak it beforehand for a few hours in cold water, then discard the water prior to rinsing the rice. Also, feel free to increase the number of cups of rice you cook at one time depending on your family’s size. Just add the corresponding ratio of water prior to cooking and know that the overall cooking time will need to be extended. Note also that even if you use these steps above to prepare your rice, the cooked rice will still turn out a bit ‘wet’ or soggy, so you may have to get used to the change in texture over time. It would also be helpful to rinse the rice a few times in water before beginning the cooking process. Although rinsing and cooking the rice in excess water will inevitably lower its nutritional content (especially as rice grain products in the United States are often enriched with iron, folate, thiamin and niacin), it may be well worth it if the arsenic content of the rice could possibly be reduced by as much as 50 percent! Plus, any amount of B vitamins and folate lost through this cooking method can likely be made up quite easily through certain other foods consumed. Questions & Answers: Arsenic in Rice and Rice Products. US Food and Drug Administration. http://www.fda.gov/food/foodborneillnesscontaminants/metals/ucm319948.htm. Updated October 25, 2017. Accessed February 5, 2018.